That itching is getting worse. It started with just a little bump on the inside of your finger, but now your whole lower arm is red, dry and itchy. And, you think it might be spreading to your leg. It’s getting so you can’t stop scratching. This is OK if you’re in your own house, but scratching uncontrollably at work or the Salad Bar at Sizzler makes it embarrassing. If you do have it, then the symptoms that Eczema causes are unbearable. Eczema Causes: What Causes Eczema? Eczema (atopic dermatitis) is a form of inflammation of the epidermis (outer skin layer.) It is caused by one of several different things, depending on what kind of Eczema you have. Contact Dermatitis – There are two different types that are curable if you remove the offending agents. Allergic – A reaction to some allergen. Irritant – A direct reaction to a detergent. 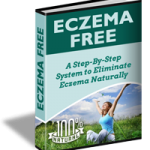 Xerotic Eczema – Starts as ordinary dry, itchy skin that turns into full blown eczema with all the symptoms that Eczema causes; very common in older populations. Seborrheic Dermatitis – Mostly occurs on the scalp; often associated and mistaken for dandruff. This eczema causes “Cradle Cap” in infants, which is characterized by a thick, yellow, crusty scalp rash. Others – There are other less common forms of Eczema. It’s not really known what the root cause of Eczema is. As discussed above certain situations and circumstances are associated with a particular Eczema. It is a persistent disease and is often misdiagnosed or dismissed as a little rash. It’s only after the “little rash” grows and spreads, and you can’t seem to get rid of it, that you start to suspect otherwise. Eczema Causes: What are the symptoms? Eczema causes irritation to the epidermis, which is the outer layer of the 3 layers of human skin. It has no definitive diagnostic test or tool, which is another detriment in diagnosis. It is eventually diagnosed on the basis of history and physical examination. If you are suffering from some of the symptoms that Eczema causes, see you doctor and discuss Eczema Treatment. Eczema causes varying degrees of redness to the skin. It is often exacerbated by the constant scratching and picking that one does on the infected area. That place that seems to just start itching out of the blue and never seems to get the right scratch may be Eczema. It can be maddening, and the urge to scratch can be overwhelming. One clue that you might have Eczema is that the itching and other symptoms seem to get worse with the onset of day or night. Some Eczema causes seasonal changes in symptoms. Which came first, the chicken or the egg? Well, the same question can be asked of the swelling that Eczema causes. Which came first, the itching and redness, or the swelling? One definitely accompanies the other, and swelling is one of the more prominent, and potentially serious symptoms. There are varying degrees of flaking when it comes to “Eczema skin.” From dandruff like particles, only noticeable on dark clothing, to cracks in the skin that resemble dry creek beds, the severity of flaking is fluid and ever changing. It rarely happens that Eczema causes infection, and when it does it is usually a direct result of the patient scratching the affected area. It sometimes happens that there is so much irritation and scratching that pustules form. If this happens see a doctor immediately. This can lead to other, more serious conditions. Eczema causes some pretty “irritating” symptoms. Along with the redness, itching, flaking, and possible infection comes a sense of constant dissatisfaction. You can never scratch the itch enough, or rub the soreness away. In some rare cases it has been known to cause depression. It can limit your social life and lead to great embarrassment. What can you do? Keep reading. In other articles you will see Pictures of Eczema and we will address how to eliminate the pain that Eczema causes; there is hope! True or False: One of the symptoms of Eczema can be depression. With easy to follow instructions and special sections on everything from Younger Looking Skin to Children’s Eczema Cures, Eczema Free Forever will give you the all natural cure you’ve been looking for. Anderson’s formula works completely; and her formula works quickly. So, if fast effective relief is what you need, get a copy of Eczema Free Forever. Do you worry about what you put on, or in your body these days? Do you suffer from Eczema? Well, if you answered yes to both those questions then Rachel Anderson has a program for you. She’s designed a cure for those who suffer from the symptoms of Eczema, and if you have it, you know what I mean when I use the word “suffer.” What wouldn’t you pay for relief from such misery; relief that comes in record time? 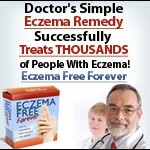 Check out Eczema Free Forever, and see. It even comes with Bonus Material including a Diet Book and a Supplement Guide. I’ve had on and off scalp eczema for years which, thankfully, is hidden by my hair most of the time. I still worry I look like some freak with a rash scratching at it. I’m definitely reading on in your blog to find more useful treatments. Kimberly, you’d be surprised how common your story is. By sharing, you help others see they’re not alone. Thanks for the help. Thanks for this informative article. For the last few years, just like clockwork, when the weather changes with the seasons I’d get a horrible itching on both upper arms. I tried to ignore it, or when it was really bad I treat it with body lotion. I assumed I just had dry skin. I had no idea I had developed a mild case of Eczema until I read your article and then paid a visit to my doctor. My condition is triggered by the dry interior heating in the dead of winter, and the hot sun of summer. Now I know what the problem is and how to treat it, and even the steps to take to avoid it becoming too sever, I am a happy camper. Fred thanks for sharing that story. So many times people don’t want to see a doctor, but your story illustrates how important that can be. Thanks again.